Kate: That’s the problem with heartbreak, because with you it’s like an atomic bomb and to the world it’s just a really big cliché, because we all have the same experience. 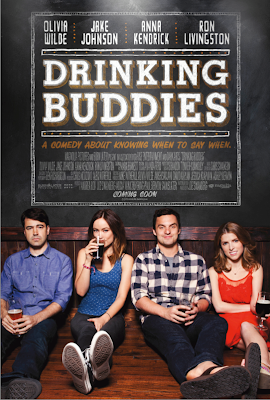 Drinking Buddies is a step forward in the film world for writer/director Joe Swanberg, who has specialized in making films of the mumblecore variety. To catch some up on what that term means, the concept of mumblecore revolves around independent films that are very low budget, largely improvised by the performers (generally amateur actors), and shot in very naturalistic ways, including lighting and real world-locations. Swanberg’s latest feature is the largest in scale, as it involves several well-known actors and a clearer structure that is somewhat familiar, but still working off what the cast brings to the material most of all. 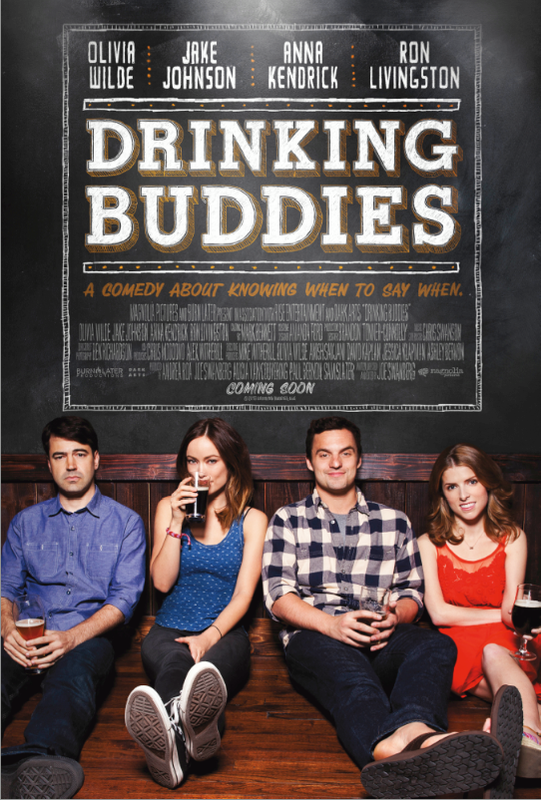 As a result, Drinking Buddies feels somewhat slight, overall, but the quality of the performances (one in particular) is enough to make it a solid watch. Setting a lot of action around a craft brewery does not exactly hurt either. The film stars Olivia Wilde and Jake Johnson as Kate and Luke, two friends who really like hanging out with each other and having a good time. They both work at a specialty craft brewery plant and tend to go out to the bar, with the other workers, and continuing having fun together after hours. Both Kate and Luke are in relationships. Kate is dating Chris (Ron Livingston) and Luke is dating Jill (Anna Kendrick). This entire group eventually meets up, which leads to a shared camping trip at Chris’ cabin by a lake. Amazingly, this does not lead to a horror movie setup; it only provides opportunity for relationships to be shaken up a bit, leading to various occurrences in the story, which continue to shake things up for Kate and Luke. There is not a whole lot to this film. It is a relationship drama, with some comedic elements, but everything revolves around these four characters dealing with said relationships and nothing else. More specifically, it deals with Kate and Luke testing the limits of their friendship and whether or not anything else could come of that. If one is hoping to see a zany comedy out of any of this, they are in the wrong place. The laughs that come from this film are based around regular human comedy, with no character attempting to really be comedic, just happening upon occasional funny asides perhaps. I point this out, because Jake Johnson, best known for being a part of the cast on Fox’s hit TV series, The New Girl, benefits the most from this film. He seems to clearly standout as the best part of this cast, but not because he is playing up the comedic aspect, as he does in his role on television (for what it’s worth, he is quite adept on the dramatic aspects of that show as well, though it’s a sitcom, therefore not as pronounced). Instead, Johnson’s Luke is a well-meaning guy who happens to share a strong bond with his female co-worker/friend. It is clear that he has been tempted, but he is also very much in love with his current girlfriend, whom he intends to marry at some point. The various shades that he must play work well in this film, because Johnson sells the role. Olivia Wilde is good enough here as well, though I am not sure if it has to do with the improvised construction of the film or not, but she does not quite hit some of the beats as well as Johnson is able to. If I were supposed to be taking a side in certain scenes, I would constantly find myself seeing from Johnson’s point of view because he seemed to be nailing the role, while Wilde seemed like she was struggling at points (the fact that I am a guy may play into it as well, but I can hardly figure out a way to consider other options in a subjective viewing experience). The supporting roles are less defined, mainly by design, but given that I am a big fan of both Kendrick and Livingston, I was happy to see them in these roles regardless, but also appreciated their presences on screen as performers. Both of these characters are reasonable people that have just enough to do, which can justify the later actions of Luke and Kate. The last third of the film is pretty much without either of these supporting characters, but the film still manages to incorporate what they brought to the story, as it further explores the main relationship presented. A real test for many viewers will involve the style that Joe Swanberg employs for this film. As he is still very much an indie filmmaker, his construction of the film very much fits the bill of things you tend to see in these types of films. The dialogue is largely improvised. There are long takes of not a whole lot happening on screen, besides silent acting to show “emotions”. And there is a reliance on the actors to keep a scene interesting, regardless of how editing could improve the scene. For some this works, for others it can become tiresome. I dig the style well enough, but the film overall works as a small scale feature that happens to feature some solid actors at work. Drinking Buddies is a fairly light watch overall, despite seeing big arguments break out and emotional drama take its toll, but it certainly is not inessential. There is enough good in this film to make it work for a viewer who likes these sort of much more low-key dramas. I would also call it entertaining, given that the cast is what really makes this movie click the most. Johnson continues to balance his sitcom star status with low budget indies like this and last year’s wonderful Safety Not Guaranteed, which has me enjoying the thought of what the future holds for him. Drinking Buddies may not be the film that will catapult him further, but it still works as a nice piece of support on the way there. Chris: Who is interested in a hike? Luke: Will it offend you at all if I say no? Agree about Johnson, but I thought Olivia Wilde was outstanding in this. She was great and this may be her career best performance, but I'm probably never going to watch this again. haha. The person who i thought struggled most was Anna Kendrick (who I do enjoy). It's an agree to disagree point, I guess. I would say it's Wilde's best role, I just still could not embrace her as much as the others for whatever reason.